Both pizzas had plenty of cheese and the toppings tasted okay, but the pizzas didn’t wow anyone at the table except for the light, flaky crust. 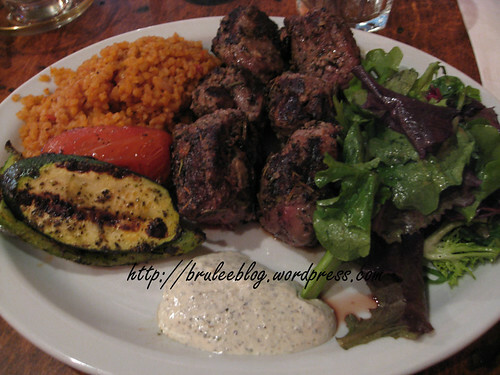 Two of us had the kebabs, which were served with a side salad, grilled vegetables, and bulgar. I quite enjoyed the bulgar as it was cooked perfectly (not too mushy and not too hard), and was seasoned well. 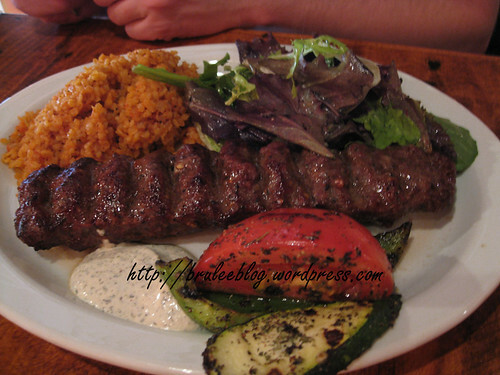 One person had the Adana Kebab made with spicy beef. Everyone at the table thought this was the best dish out of all that was ordered. The beef was tender and the portion was generous. I had the Kuzu Sis Kebab nade with herbed lamb and grilled to medium well. The lamb pieces were large and were heavily seasoned with rosemary (and probably oregano, but the rosemary is what stood out in my memory). The menu actually says that the meat would be grilled medium to medium well, but I wasn’t asked which I preferred. The lamb was decent but to be honest, it wasn’t really that different from any lamb I’ve had from Greek restaurants and I would have preferred meat that was closer to medium than medium well. All in all the meal was pleasant, but I think we were all expecting more since none of us had ever been to a Turkish restaurant before. Service was pleasant and relatively prompt. We did have one hiccup – one of the dishes served wasn’t what was ordered – but the server caught it right away and corrected the mistake. We didn’t end up getting charged for our pekoe-tasting tea, although the server didn’t mention it so I’m guessing it was because of the error but I don’t have a confirmation for the reason. Would I go again? Possibly. But I have a feeling I’d probably end up at a Greek restaurant instead. Too bad the pizzas weren’t all that great because they look it. Oh don’t get me wrong; they tasted fine. 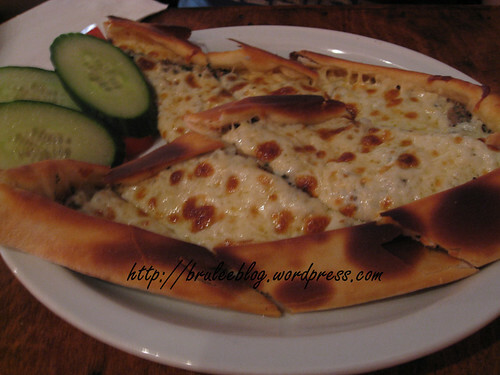 But other than the crust it wasn’t anything that I’d want to go back specifically to order. Okay, it all now totally made me hungry. But the nicest thing of all was the Turk Cayi. What a wonderful color. And anything served with a sugar cube is just fine by me! It was very pretty, but pekoe is pretty common and I was expecting something different like how Turkish coffee is a little different from regular coffee. I adore Turkish food, particularly kebabs. It’s neat that they served a side of bulghar pilaf – is the orange color from tomato do you think? I want to know how they made it, nosy bugger that I am. And I agree with you that putting tea in a Middle Eastern style cup doth not a Turkish tea make. Possibly tomato, but I’m going to guess saffron. It definitely isn’t from curry. I’d heard a lot of great things about this place, and its the first time I’ve seen images of the food from it, thanks for sharing. 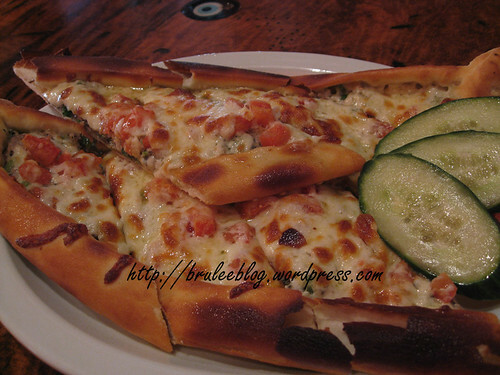 Anyone who doesn’t know Turkish cuisine might think it’s more or less like Greek food but that is not the case. I have had Greek food in the UK, in Western Europe and in Canada and despite trying different price classes and different dishes have only one word for Greek food – greasy. I have never had Greek food that didn’t make me feel nauseated and I’m a vegetarian, so I didn’t even have fatty meat or anyhing! I will be going to Sofra for the first time next week and looking at the photos published and considering the friendly voice on the phone at the restaurant, I’m looking forward to the experience. Not trying to be a know-it-all, but if I ate meat and wanted my meat a certain way, I would ask them for medium OR medium well, depending on what my preference was and not leave it up to the chef. As to the tea, the small glasses (keep the tea hot for longer than porcelain) are typically Turkish, ‘Turkish tea’ might connote the tea being of Turkish origin, but since you cannot get Turkish tea everywhere, a lot of Turks I know will just use a good quality black tea. The method of brewing Turkish tea is just as important, though, it’s not just pouring hot water over tea leaves or a teabag (check it out, if you’re interested) and therefore makes for a much stronger and flavourful tea, which is what is popular among Turks. Hi Esther, I certainly don’t think that all Turkish food is like Greek food. However, the food that I had at Sofra (and maybe we just ordered the wrong dishes), didn’t necessarily strike me as extremely different. Turkey is right next to Greece after all, so I would expect there to be some sort of crossover. Regarding the meat, I usually don’t ask people to cook meat a certain way unless I am eating something like steak, or if a server asks me my preference. I’m fine with eating something well done, but in my opinion no restaurant should be cooking meat until it’s dry. 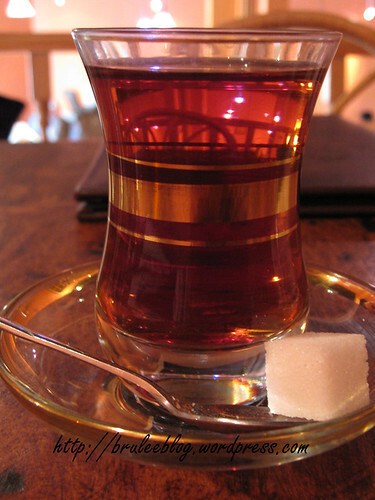 About the tea – why advertise it as Turkish Tea if it’s just regular tea? I drink a lot of tea and orange pekoe is one of the lesser grades of tea. This didn’t taste like high quality black tea to me at all. Did they prepare the tea in the traditional way? Maybe. They did that in the kitchen and I never saw the preparation. Were my expectations too high? Possibly. Please keep in mind that these were just MY opinions from MY visit, and I’m just one person. I know a lot of people who like eating at Sofra. I hope you come back and let me know what you thought of the food.